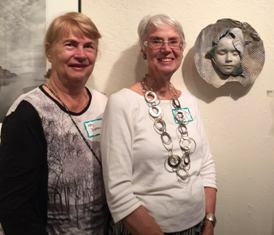 Kay Duffy and Starr Davis both have pieces accepted in Arrangements in White & Black National Juried Show at the Santa Cruz Art League. Starr’s entry in the show is Wave Child, a ceramic sculpture shown here. Kay Duffy's entry is Tiger Tiger.